Malaysian shuttler Lee Chong Wei was hailed as a national hero Monday despite his bitterly disappointing finals loss to China‘s Lin Dan, which deprived the nation of its first Olympic gold. The silver medal was Malaysia‘s best result in 12 years at the Olympics and the best achievement by a singles player. Malaysians followed Lee’s progress at the Beijing Olympics with enthusiasm, hoping he could break a drought for the country, which had not won an Olympic medal since 1996 and has never claimed gold. Since Malaysia started taking part in the Olympics in 1956 at Melbourne, it has won two silver medals, including Chong Wei’s, and two bronze — all from badminton. An erratic and strangely subdued Lee Chong Wei crashed out 12-21, 8-21 to China’s Lin Dan in one of the most one-sided contest for the men’s singles Olympic badminton gold. The top-seeded Lin was in control from the outset and coasted over the second-seeded Malaysian to give China its third gold medal in badminton. Lin took an 11-1 lead in the second game with Lee’s only point coming on an unforced error by Lin. Chong Wei, though, is virtually certain to end up as the most successful Malaysian participant in the Beijing Olympiad with the loser’s consolation of a silver medal. “Chong Wei gave his best but China’s Lin Dan performed extraordinarily to deny us,” Youth and Sports Minister Datuk Ismail Sabri Yaakob told the state Bernama news agency. “Chong Wei will still be considered a hero because he has contributed a silver to the country and at the same time ended a 12-year wait as Malaysia had not won a single medal since the 1996 edition,” he said from Beijing. The world’s number-two player was contrite and offered no excuses for losing the highly anticipated match. “I feel so sorry for the loss. I hope they (the fans) don’t blame me and I can continue my badminton career and come to the Olympics again,” he said. His father, Lee Ah Chai, who watched the match at home along with a large media contingent, said his son had clearly been under pressure. “I hope the people of Malaysia are not angry and disappointed because Chong Wei has tried his level best,” he said according to Bernama. “I am not disappointed because has made it to the final and done his best,” he said. Under a government incentive scheme, Lee will win 300,000 ringgit (90,000 dollars) for his silver medal, as well as a 3,000 ringgit monthly pension. 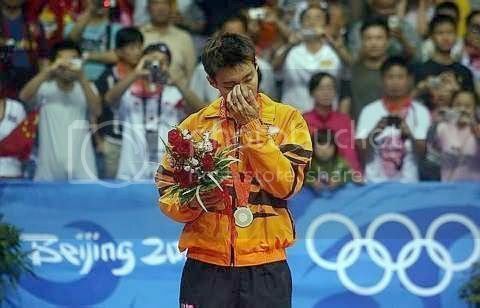 Lee Chong Wei returned home today with a heavy heart after his failure to nail the first gold medal for Malaysia in the Olympics. But getting a hero’s welcome at the Kuala Lumpur International Aiport (KLIA) brought back the smile on his face. About 300 people with huge congratulatory banners greeted Chong Wei and the Malaysian badminton team at the arrival hall to the beat of the kompang and thunderous applause.